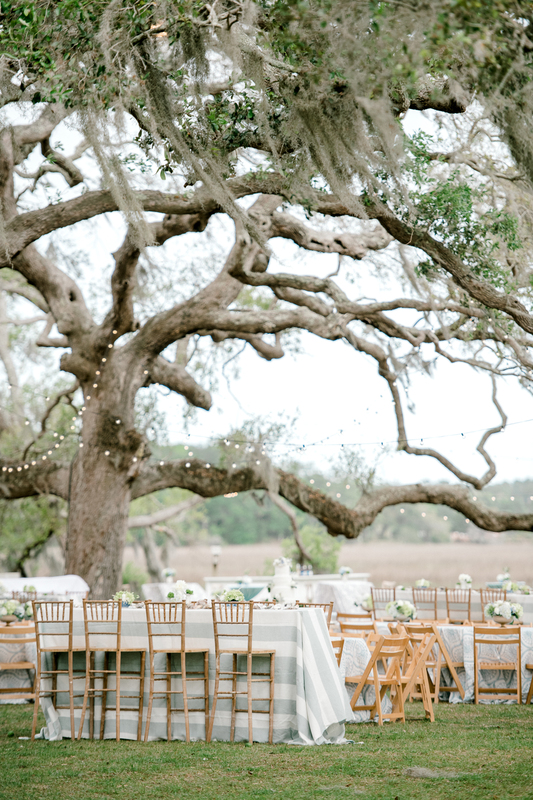 With so many beautiful weddings in our print issues, it’s always hard to pick a favorite. 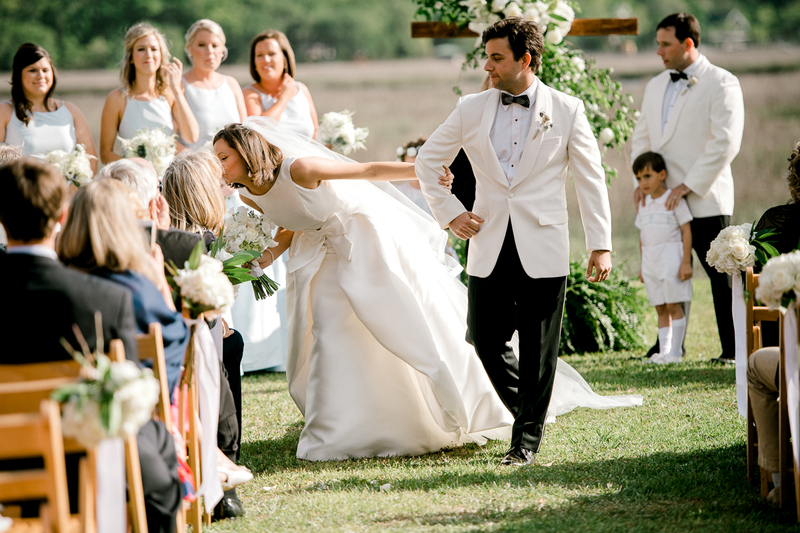 However, when the bride emulates Jackie O’s elegant style, describes her wedding day look as “Kennedy-inspired,” and then calls their wedding day theme “Southern elegance” with personal touches, it’s hard not to choose it as my favorite! Lauren and John knew that fall in the South was just too pretty to pass up, so after consulting both the SEC football schedule and the Farmer’s Almanac weather projections, they decided it was the perfect time to celebrate with their family and friends. Their wedding at the Rye Patch pairs a beautiful and romantic color palette with the crisp air of fall in such a way that is as classic as Jackie O. herself! With the help of her sweet mama, a talented artist, Lauren incorporated hand-painted floral watercolors into their details that added even more beauty and meaning to their day. 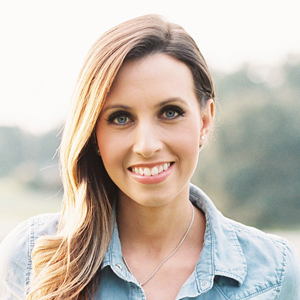 Big SW hugs to Ashley Seawell for sharing her beautiful work with us in V8! Tell us about finding your wedding dress. What was your favorite thing about it? I emulate Jackie O’s crisp, elegant style and wanted something structured and architectural. I knew lace or ruching (though beautiful!) was not me, and the “no ruche, no lace” rule left some boutiques with literally nothing to show me. The Amsale Jane dress caught my eye immediately at The House of the Bride in Augusta. It was the second dress I tried on, but being a “researcher,” I did not make the decision until after I hit the Boston boutiques. As I’ve learned, first loves are hard to beat! My Kennedy-inspired “simple with a twist” look was answered by the Amsale gown, complete with the classic bateau neckline and streamlined silhouette, and the unexpected organza train in the back made my heart flutter. I’ve always been a big shoe lover, so when I found my white Chanel shoes with white soles (and thick enough heels so as to not aerate the outdoor lawn location), the look was complete. I wish I could wear it again! Describe your bridesmaids’ dresses. How did you choose them? I let my bridesmaids select their own dresses, and I gave them guidance of a neutral color palette. They are each such beautiful, special women; I wanted to see those unique personalities come through in their dress selections and have them feel comfortable in a dress of their choosing. I loved the differing textures and colors, and each woman looked stunning! I couldn’t have picked out better dresses if I tried. 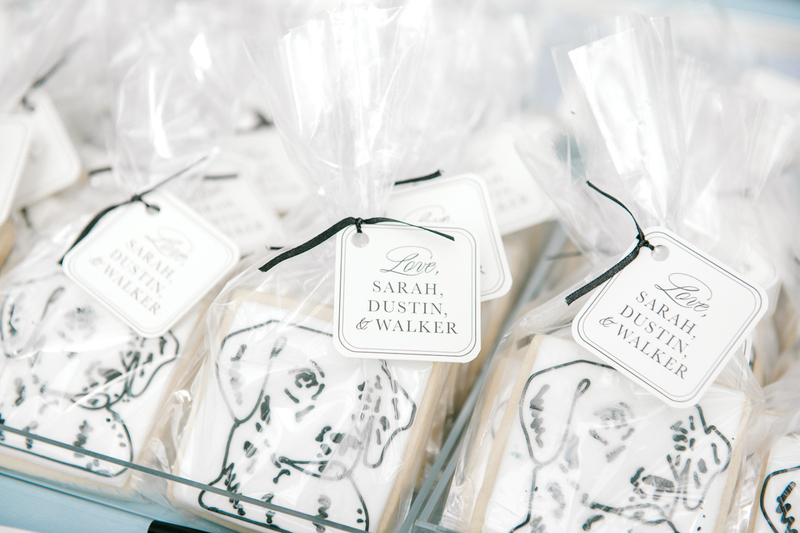 Our two biggest themes were “Southern elegance” and “personal,” so we wanted our fingerprints all over the wedding. The ceremony was one of the most intimate and important details to us. We wrote our whole ceremony together, and the judge John clerked for was the officiant. Since we wrote the ceremony ourselves and are both music lovers, we viewed the ceremony and the music as our readings. We borrowed a line from a Native American blessing that we still love, as it speaks both the individuality and plurality of marriage: “Now you are two persons, but there are three lives before you: his life, her life and your life together.” Judge Cothran also imparted words of wisdom to “always have fun,” and we bring up his advice to provide perspective when we need it. What made you choose your ceremony and reception venues? Did they have any special significance to you?The venue was very important to ensure our classic Southern theme would come to life. Since we both grew up in Augusta, we wanted to get married in that area. 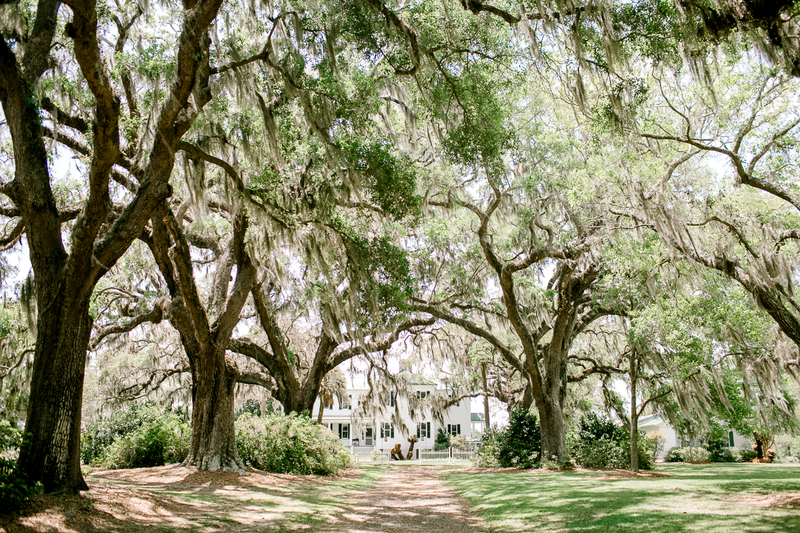 We established two criteria: an outdoor venue with live oaks for the ceremony, and the ceremony and reception sites being within walking distance, so people only had to park once. When my mom sent pictures of Hopelands Gardens and The Rye Patch, we immediately fell in love with the location. It was the perfect venue for us. We wanted the menu to scream Southern, but also include some family recipes. We had a carving station with beef tenderloin, Augusta green jacket salad, charcuterie and cheeses, shrimp and grits, and grilled pimento cheese with tomato soup, to name a few dishes. Boiled peanuts were strategically placed outside on various tables for people to snack on. Tell us about your wedding flowers. Karin Jeffcoat of Cote Designs has exquisite taste, and incredible vision and execution. 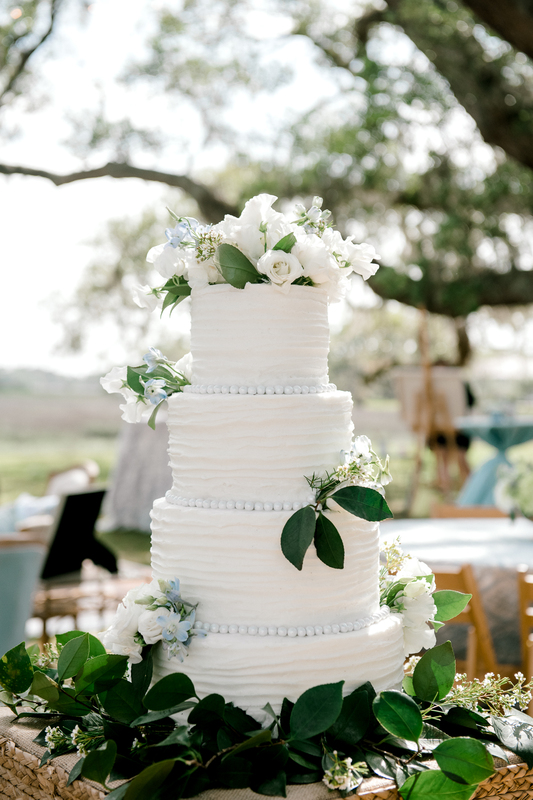 I wanted organically shaped bouquets, maidenhair ferns, and the feel that the flowers had been plucked from a Southern grandmothers’ beautiful garden for an afternoon party. Even though it was a fall wedding, we wanted a soft color palette for the wedding: moss greens, pale peach and whites. In the reflecting pool at the ceremony location, Karin built floating magnolia leaf wreaths around lanterns that shifted when the wind blew — it was stunning. She nailed that natural, simply elegant look, accented with vintage gold, brass and cut glass vessels. My mom’s hand-painted watercolors of botanicals and flowers echoed this theme and added extra personal touches to our décor. All the boutonnieres had flies tied on by the groom, in honor of his favorite pastime of fly fishing. Our thought was that if one cake is good, 10 is better. We wanted the look of handmade treats brought in by many people, so we had several cakes, both naked and frosted, in different flavors. Cote Designs made sweetgrass pedestals and also placed some in bell jars. Coconut cake was the main cake, and displayed a topper from John’s parents’ wedding. We also served red velvet, seven-layer caramel as the charm pull cake, a German chocolate torte, pound cake with fresh berries and cream (John’s favorite), and my grandmother’s famous chocolate cake recipe. Describe the proposal: In September 2013, John took me on a “mystery trip” (an activity we try to surprise each other with a few times a year) to Woodstock, Vermont. Woodstock is a classically charming New England town that has a special place in our history, as we visited for dinner and skiing several times during his visits to see me in business school. 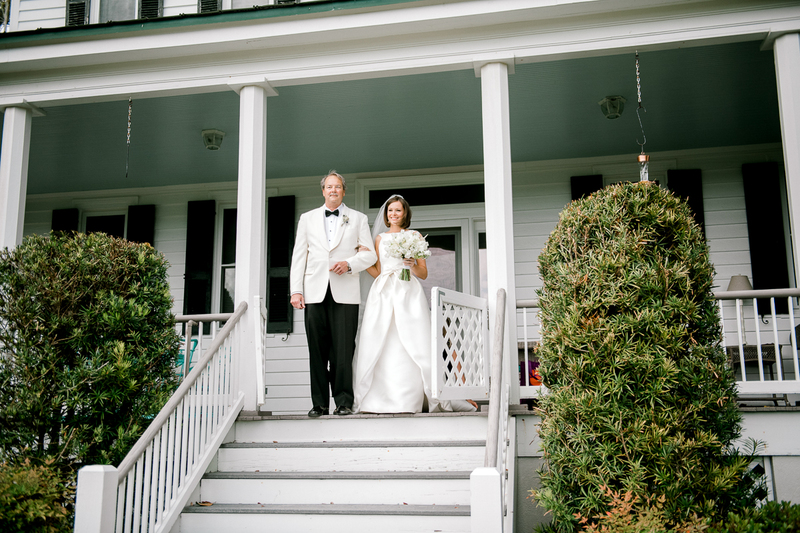 September in Vermont meant beautiful foliage–the perfect backdrop for a very memorable day. We went for a walk after breakfast, and John asked me to marry him in front of a classic Vermont covered bridge. After sharing the news with friends and family, we went for a hike and had dinner at our favorite spot, where (knowing how sentimental I am) he had pre-selected handmade wine glasses ready for us to enjoy during the meal and take home as a keepsake. We are still enjoying those glasses at dinners at home in Charleston. Tell us all the basics of your wedding! On October 11, 2014, we had outdoor ceremony in Hopelands Gardens and a reception at the Rye Patch in Aiken, South Carolina. The 4:30 P.M. ceremony and beautifully sunny day took us into a gorgeous, dance-filled night under the stars (no tents! Which was a nervous gamble, but it paid off when the weather cooperated!). Both being huge SEC fans, I always joked that no self-respecting Southern woman would get married on a Saturday in the fall…which I promptly did anyway because the time of year for an outdoor wedding was too good to pass up. When picking a date, we consulted both the football schedules and the Farmer’s Almanac weather projections. In retrospect the “not too bad” game weekend ended up being closer/bigger than we had originally thought, but people were too busy dancing the night away to be missing the Dawgs or Crimson Tide too much! How many guests attended your wedding? Approximately 170 of our favorite people from all over the country gathered in Aiken for the weekend. We were able to rent out The Willcox, a historic, charming inn less than a mile away from Hopelands for most of our family and wedding party to stay in. Groom’s favorite detail of the wedding: Having the judge John clerked for and remains close to officiating was very personal and special to both of us. What was the design inspiration for your reception? The Rye Patch is a historic estate maintained by the city of Aiken. I wanted our reception to feel like it was a backyard reception at an elegant Southern grandmother’s home. The natural landscape and the pristine interior were a stunning backdrop, to which Karin at Cote Designs and my crafty mom added special details throughout. We risked it and went no-tent (not going to lie, that did cause a lot of anxiety in the days leading up to the event! ), but the layout helped transition from sunset into the nighttime dancing. It was a magical garden dinner and dancing party under bistro lighting hanging from the huge oak tree. We loved it! Were there any family traditions you included in the reception? We included family recipes and favorite dishes into the menu, including my dad’s famous mashed potatoes, John’s favorite cake, and my grandmother’s frosting recipe. We also had the wedding pictures of our parents and grandparents near the parting birdseed and vintage postcards that served as our guest book. What’s next for you as a couple? What are you looking forward to in the future? Moving 1,000 miles from Boston to Charleston the week before the wedding and John starting a new job meant a lot of exciting change in October. We are looking forward to exploring our new hometown of Charleston, finally being within driving distance of family in Augusta, and enjoying our time as husband and wife. What advice would you give to someone currently planning his or her wedding? If you are having an outdoor wedding, the rental costs for the space can be lower, but don’t forget about all the rentals you have to bring in (chairs, tables, linens, lighting, etc.). Don’t forget to check how much power you’ll need for lighting and a band…you may need an extra generator at the last minute! Who was your favorite vendor and why? My mom is the MVP–she was incredibly patient, creative, and dedicated. We could not have had the wedding of our dreams without her support and love. Thank you to her, all our vendors, and to all our friends and family who made this day so special for us. Say Howdy to Our Newest Blue Ribbon Vendors! It’s really a joy to get to introduce y’all to a new set of Blue Ribbon Vendors each month, because I just know any one of them would be a joy to you if you choose to work together! This time around, we’re introducing you to a few of them through their answers to some of our favorite BRV interview questions. Click through to their listings to find out more about them! Favorite thing about weddings in the South? 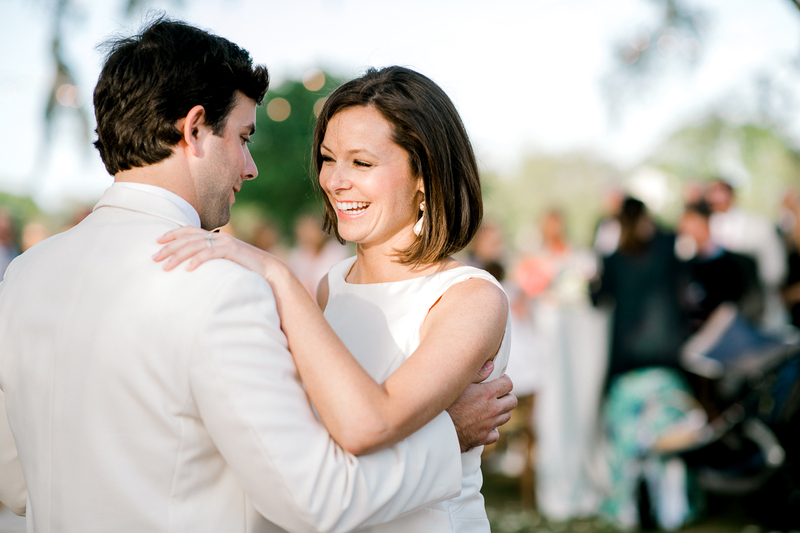 Southern weddings are so rich with family, friendship, Southern culture, and memories. I love how I can see a little piece of my own family background and culture in each and every Southern wedding I’ve worked on. Early bird or night owl? I guess I have to say early bird. I get up almost every morning at 4:30 to workout – commitment and dedication, right there!! Favorite thing about weddings in the South? The elegant and understated charm of each event. Favorite part of a wedding day? Everything! I feel like I’m part of the family the moment I walk in the door. I get to hear the bridal party reminisce on the good ole days, see the bride read the letter from her groom, watch the mother of the bride help her daughter into her dress… it’s so emotional, and I thank God everyday that I get to be a part of it! How I got into weddings: I was always a lover of antique and vintage things. I rented vintage for my wedding three years ago and I became enamored with the idea. I started collecting and renting pieces out of my garage. From that point it was just a slow evolution from the rentals to what now is a full service styling/planning/floral design company! Favorite thing about weddings in the South? Great outdoor wedding weather! We squeeze a little more warm weather out down here… which means more tea-sippin’, fan-waving, biscuit eat’n, outdoor wedding goodness! Favorite thing about weddings in the South? I love all the personal details we incorporate into weddings here – the custom monograms, special paper details – I love it all. I also think, in the South, the guest experience is very important. Southern hospitality is of utmost importance to our couples. Favorite part of a wedding day? My favorite part of the wedding day is the bride and groom’s first dance. I often find myself tearing up behind the camera! How I got into weddings: I’m really a documentary photographer at heart. I gravitate towards authentic images that have meaning. Weddings offer me the opportunity to make something that means something to my clients and their families. Wedding photos are priceless by nature, and having the chance to capture something both momentary and invaluable is thrilling as a person and a photographer. How I got into weddings: There are three things my husband and I love: Jesus, each other, and (being true Southerners) college football. Shortly after we got married, I wanted to pursue photography, but being newlyweds, we couldn’t afford a nice camera. My husband and my brother ended up making a friendly bet on a football game (Texas A&M vs. Baylor), and if our beloved Aggies won, my brother would buy us the camera I’d been eyeing. If Baylor won, we’d name our firstborn after him. As luck would have it, the Aggies pulled out a victory, I had the camera a week later, and the rest is history! Check out all of our favorite vendors in the Blue Ribbon Vendor Directory! I also wanted to mention that we’re working particularly hard to expand some of our areas of slim pickings – namely, Kentucky, Mississippi, Oklahoma, and West Virginia. If you would like to recommend someone (or nominate yourself!) for any of these states, please email emily at southernweddings.com!